I am very lucky to have friends that sew. I am not so lucky though because they all live so far away we rarely, if ever, get to sew in the same room. 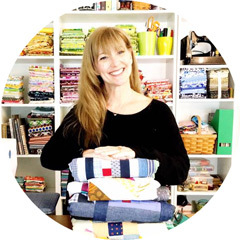 Sometimes I have the opportunity to have my sewing friends come over and with all the kids around we at least get to talk sewing and share some beautiful fabric and some projects that are in the works. This past week I had a visit from Amy Lou Who. I am sure I mentioned how we met at the local Costco over her bag ( please get the pattern done on that so I can make it). She had just found out she was having a girl!!!!!! And she was buying the sweetest little onsies. She was beaming and beautiful (as always). We have been friends ever since. My Adam had skipped lunch and so he was in a mood when we finally got back to the house. I made chocolate chip cookies and that seemed to help :o) Chocolate chip cookies are magical!!!!!!! Amy brought me some fabric for me and some cuteness from my new grandson ( I get to go visit him next week!!!!!!) The owls are ab fab!!!!!! Love you guys!!!!!!!! Thanks for visiting!!!!!! It's true. It will never be long enough!!! I didn't want to leave either. Aww, what beautiful pictures! I see what you were saying about the chocolate chip cookies, rofl! I love how they are hugging, that is such a cute one!